This past weekend we set out by ferry to San Juan Island to explore something that we'd recently heard about on the Lore podcast. That is the John S. McMillin Memorial Mausoleum, commonly known as Afterglow Vista. This mausoleum is hidden on a hill by trees, only accessible by walking a trail which goes through a nearby graveyard. Once you come to the monument you're awe struck by the size, beauty, design, and all of its masonic symbolism. Sitting on one of the six limestone chairs may make you feel uneasy if you know what lies within them. This memorial is astonishing with all of its history, symbology, and secrets. John Stafford McMillin, while not solely responsible for the founding of what is now known as Roche Harbor, was at very least a significant founding member. A wealthy industrialist earning his wealth from the nearby limestone deposits that created the lime needed in cement, steel, fertilizer and numerous other products. John was an educated man, a proud husband and father, he was a Mason, he was religious and the back of the chair that holds his ashes states he was an Elk and Knight Templar. Once you begin to take all of this to heart and read the sign that denotes the significance of the each element of the structure, you find much thought and effort was put into this design. "The structure is approached by two sets of stairs, representing the steps within the Masonic Order. The stairs on the east side of the mausoleum stand for the spiritual life of man. The winding in the path symbolizes that the future cannot be seen. The stairs were built in sets of three, five and seven. This represents the three stages of life (youth, manhood, age), the five orders of architecture (Tuscan, Doric, Iconic, Corinthian, Composite), the five senses, and the seven liberal arts and sciences (grammar, rhetoric, logic, arithmetic, geometry, music, astronomy). The columns were created to be the same size as those in King Solomon's temple. The broken column represents the broken column of life-that man dies before his work is completed. The center of the mausoleum boasts the round table of limestone and concrete surrounded by six stone and concrete chairs. The chair bases are crypts for the ashes of the family, while the whole represents their reunion after death. The construction of the mausoleum began in 1930 and was completed to its present state by the spring of 1936 at a cost of approximately $30,000. McMillin had planned to erect a bronze dome with the Maltese cross atop the edifice. He had ordered the dome, but his son, Paul, cancelled the order, as the company did not have the $20, 000 it would cost." The trail to the mausoleum is a short half mile. It begins just outside an old cemetery and winds around grave sites delineated by rectangles of picket fencing. Some of the graves have discernible markers and display Japanese names (many of the workers for the family company were Japanese). It is a quiet walk through the woods that meets a gravel road and leads to the memorial. As Afterglow Vista begins to come into view, you first see a rough hewn, stone wall with a pilaster to each side of an entrance. Something you'd expect at the entry to a medieval castle. Arced atop the pilasters in metal you read, "Afterglow Vista". Beyond the opening your thoughts may be that you've stumbled upon some remnant of a Roman Colosseum. Large columns with an ornate ring connecting them around the top, stairs and pillars. More closely and now the limestone table and chairs come into view. Though this is a mausoleum and does contain the ashes of several family members, and McMillin's personal secretary, it is quite the lovely scene. Built atop a small hill, the dappled light through the trees plays off of the mausoleum. The sort of pale peach and orange colors of the structure magnify the light and mimics the colors of the surrounding madrone trees. Looking straight up from beneath the ring of the open roof, the sky is stark blue against the apricot color. While there have been numerous stories of supernatural happenings at this site, our visit was peaceful, serene and contemplative. 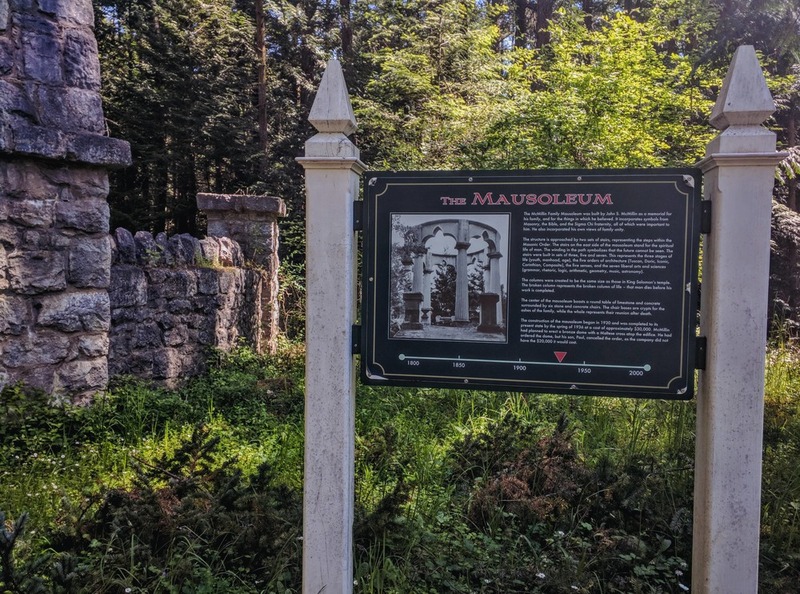 The mausoleum has succumbed to several instances of vandalism over the years and in older photos there can be seen two birdbath shaped planters that no longer are present. One instance involved one of the chairs being completely removed. The site is on the National Registry of Historic Places and should be shown respect. It's most importantly the resting place of the family who had it erected, may they rest in peace. When we heard about this place, we knew we had to visit. We love to be outdoors, to be surrounded by nature, but we're also exceptionally intrigued by the unusual. This is certainly unusual. 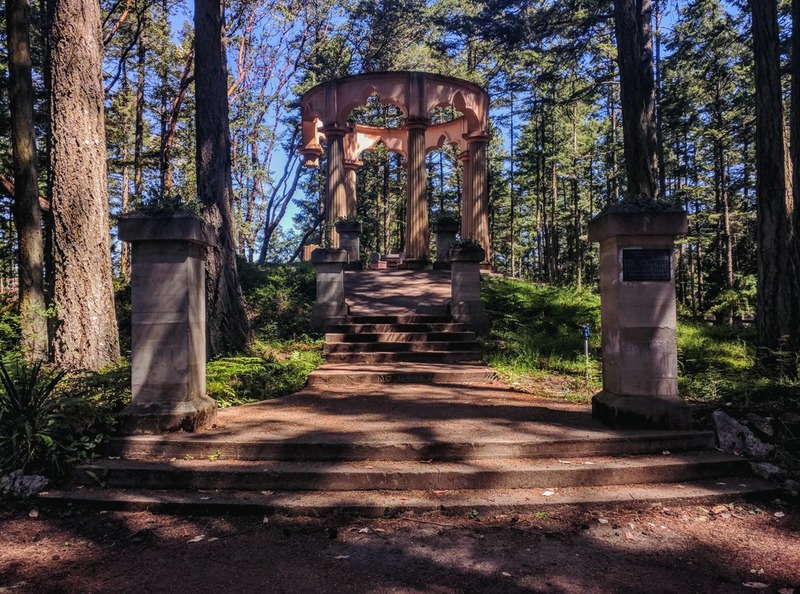 If you happen to find yourself on San Juan Island and have the time to make a little detour, visit Afterglow Vista. Go for the supernatural aspects, go for the symbolism, go for the architecture, but go with respect. This is definitely a trip you'll need to plan out ahead of time to visit. We chose to stay three days on the island to explore Afterglow Vista and everything else out that way, which is a lot! Friday morning we left home and headed to Anacortes to catch the 2:40PM ferry to Friday Harbor on San Juan Island. We arrived a couple hours early so we explored a nearby park, Washington Park, which is a pretty great spot. The ferry cost us about $77 for a standard vehicle and two adults, thankfully this was the round trip price. Once we arrived at the island we drove to our hotel we had already booked. This was The Orca Inn, certainly nothing fancy. But hey, at about $70/night, compared to everything else in the area running around $200/night, this was the way to go. Especially since we'd be out all day long exploring and only using the place to sleep and shower. We took the rest of the evening to check out the local downtown area for a bit then called it a night. The next day we headed to the memorial which is on the other end of the island, about a 20 minute drive. Upon arriving we looked for parking spots near the trailhead but every open area we saw had signs indicating private property and no parking allowed. So we drove down the street a bit and found this pretty amazing sculpture park. We parked there, visited the area for about an hour, then walked to the trailhead. Unless you're staying somewhere in Roche Harbor, this is probably the best spot to park. The path to the Mausoleum is clearly marked.